furry boots: Shop till you drop in Hoi An!!! 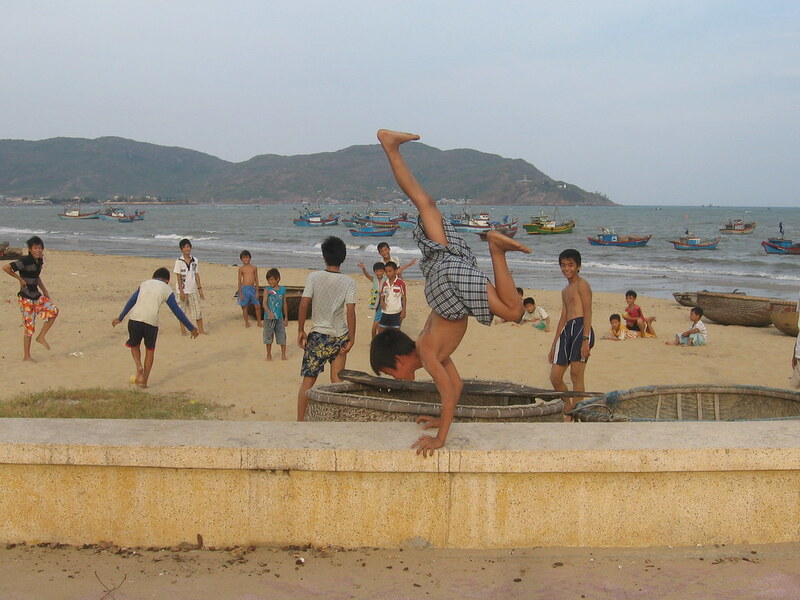 From Saigon we boarded our first train in weeks and crawled up Vietnam's spectacular coastline to the seaside town of Quy Nhon. It was bliss, hardly any other tourists. In the evenings the sea front has a carnival feel to it. Football games are taking place all along the beach and families are tucking into barbecue snacks, fruit on sticks and ice cream bought from street vendors. We hired bikes and explored some of the local Cham architecture and followed the coastal road to visit a Leper Hospital. The real highlight (apart from the lack of other Westerners) was the food. We stuffed our faces full of delicious shrimp and crab in an excellent seafood restaurant called 2000, and had the tastiest and cheapest bowl of beef noodle soup (Pho bo). Street vendors and cafes often specialise in serving just one dish. From our hotel balcony I had spent a good hour watching the streams of hungry and happy customers who had visited the Pho cafe across the street. It was so simple. A lady sat at the entrance guarding a cauldron sized pan of steaming broth, which she delicately ladled into a bowl with noodles, beef, mint, coriander and other herbs. There was just such a great atmosphere about the place. There may have only been one thing on the menu but everyone who came there knew it was guaranteed to taste good. And it did. I had finished mine before Kathy was even halfway through her bowl - slurping my way to noodle nirvana in true Vietnamese fashion. Pho is something more than just a food in Vietnam, it is part of the way of life. The Vietnamese eat it at any time of the day, for breakfast, for dinner or just as a snack. We tried hard to think of the nearest equivalent in Britain, a ubiquitous snack for any time of the day, and the nearest we came to was the sandwich. Some of you may choose to opt for the 'pie' or the packet of crisps. Another train ride took us to the ancient town of Hoi An, famous for its hundreds of tailors and shoemakers. In Hoi An, they will literally copy and make any piece of clothing or shoe. For a teuchter lad like mysel the idea of tailoring is an alien concept. I'm happiest clothes shopping when the first thing I try on fits and I can devote the rest of my day to Fopp. Kathy was having none of it. In the absence of any understanding and sympathetic female company, I was going to learn the rudiments of 'shop till you drop' theory even if it killed me. There were lots of other rules but by the time we started shopping I had forgotten what they were. There is something very luxurious and flattering about having someone spending lots of time helping you choose a suit fabric and lining. Now, I don't often wear a suit but I found myself suddenly contemplating buying two of them. "When will you wear it?" Kathy quizzed. "Certainly not to school to get covered in glue and paint!" I'm going to wear it whenever I feel like. I'll be a mod like in Quadrophenia and buy a scooter to complete the look. I'll board the 5.15 train and move to Brighton and listen only to the Small Faces and Northern Soul. "I'll maybe wear it for weddings," is what I actually said. "But you have your kilt!!" True. By the end of the day I had purchased 2 suits, 3 shirts, 2 pair of linen trousers and 1 pair of linen shorts - all tailor made. Kathy had purchased 3 dresses, 2 skirts, 2 shirts, 2 tops, 1 pairs of shorts, 2 pair of trousers, one pair of knee length boots and a personally designed pair of light blue trainers with a gecko motif on the side. All custom made. At the end of the day we both dropped, completely exhausted. It was then that I remembered rule no. 5. Don't go crazy mad mental on the first day - you can always come back tomorrow. Oh dear... Marks and Spencers will never be the same again.